Should the nation’s largest infrastructure loan program finance projects that make the transportation system more productive and efficient? Hell no, says Senator David Vitter, ranking member of the Senate Environment and Public Works Committee. Hundreds of millions of dollars should be available to any old project that comes along, as long as it has a good shot at repaying the loan. It doesn’t make any sense, but MAP-21 changed the federal TIFIA loan program to award loans on a first-come, first-served basis. Credit-worthiness is the only remaining criterion. And at the same time that it removed all selection criteria, Congress increased funding for TIFIA nearly ten-fold — a lot more money to throw at useless projects at a time when very few government programs are being expanded. Some of us are a little concerned that in the DOT application, however, there is a new term in there: “public benefit,” asking for a description of “public benefit.” Why is that inserted in there? Because it’s not what we wanted to get back to: eligibility, either you’re in the box or not, either you’re eligible or not — and credit worthiness. The concern is that something like public benefit obviously is completely subjective and would re-insert tremendous administration discretion, which quite frankly we didn’t want to do. “And I think we should continue working towards that,” he said. Foxx also noted that many transportation projects are worthwhile, even when they can’t attract private sector financing. “While some projects are great candidates for public-private partnerships, there are some projects that are simply part of the public good — and will never qualify for a public-private partnership — but aren’t unimportant because of that,” he said. That must have been reassuring for Sen. Ben Cardin (D-MD). In his opening remarks, Cardin cautioned against using TIFIA to build unnecessary new toll roads at the expense of other crucial investments. After all, as Cardin noted, 84 percent of TIFIA money goes to new highways. In his state of Maryland, where many constituents commute to downtown DC through some of the worst traffic congestion in the nation, highways aren’t the solution. “We need help on transit projects, and yet transit projects are having a difficult time getting TIFIA funding,” he said. Cardin added that the transportation appropriations bill the Senate was in the midst of debating doesn’t provide much hope for robust investments. Senator Sheldon Whitehouse of Rhode Island said TIFIA wasn’t a good fit for his state, either. “I’m a big fan of the TIFIA program, but my Rhode Island director of transportation, Mike Lewis, tells me we’ve got nothing that qualifies for the TIFIA program,” Whitehouse said. “We’ve got plenty of highways that need to be repaired; we’ve got plenty of bridges that need to be repaired.” But TIFIA “simply doesn’t apply” in places that aren’t building new toll roads with revenue streams to pay back the loans and private investors. Several transportation officials and industry representatives testified at the hearing that the process for TIFIA was too slow, having expanded so suddenly. Foxx said they were in the process of hiring 16 new personnel, which should help allay those concerns. And then Foxx proceeded to poke Inhofe, ever so gently, in the eye. 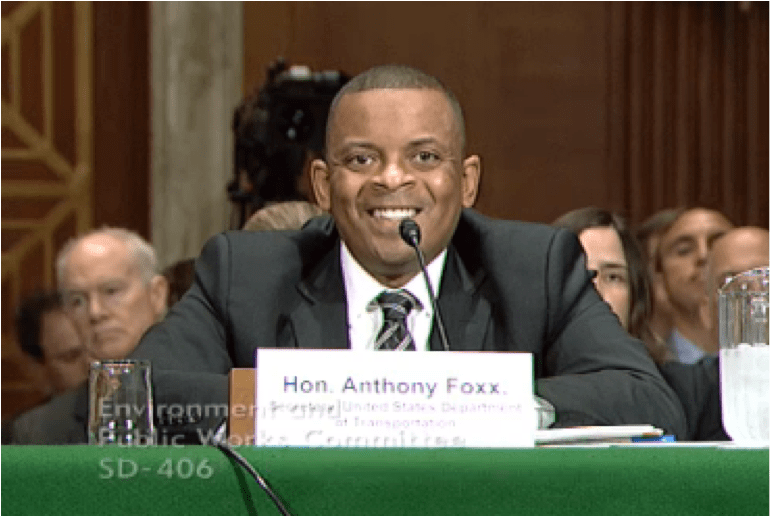 He asked Foxx about his experience dealing with infrastructure matters as mayor of Charlotte, North Carolina, and Foxx proceeded to talk about the problems caused by sprawl and solved with transportation choices — including bike paths, the object of Inhofe’s scorn. It was a stunning little speech, told extemporaneously at the tail end of his very first Congressional testimony. In Charlotte we had gone through a period of about 30 years of dramatic sprawl expansion as a result of our ability to annex. And shortly after taking office it became very clear to me that we weren’t going to be able to annex any more, both because the laws had changed but also because we’d run out of land. And yet we were experiencing exponential population growth — in fact, it was the fastest-growing metro region in country. And so our transportation systems have to do several things at once. It has to move things and people. It has to enhance the ability to make good land use choices. And it has to, hopefully, provide people with a reliable way to get someplace. So for us it was highways, it was transit, it was bike paths and sidewalks, it was bridges. And when those things all work together well, what happens is that people have choices. And when they have choices, they feel empowered. And that is ultimately what transportation does for our country: It empowers people to have a good quality of life and have good jobs. Could Ray LaHood have made a speech like that three weeks into the job? I have a diaper transportation system that is a sure bet, can I get one of these here loans? Thanks for that line. I’ve been laughing out loud for 10 minutes. Good one!